AssetManage Home Edition 2006 is personal finance software developed by Liberty Street Software. 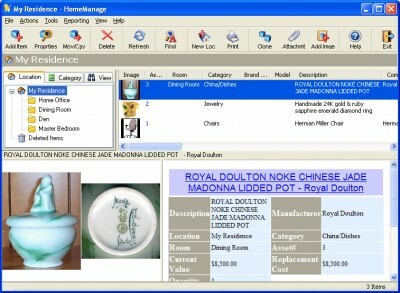 Using AssetManage Home Edition, you will have a complete inventory of everything in your home. Invaluable for insurance purposes in the case of theft or loss due to natural disaster. Use our Estate Planning features to name beneficiaries of your assets. Attach images, files and URLs to your records. Easily track repairs and other expenses related to a possession. Keep track of Warranties & Leases. home & hobby software is demo, which means you can download and use this limited edition of AssetManage Home Edition 2006 for free. To use full version of AssetManage Home Edition 2006 you have to buy the personal finance product for $34.95. AssetManage Home Edition 2006 is available at regnow and Liberty Street Software website. AssetManage Home Edition 2006 supports English interface languages and works with Windows 98/XP/Vista. Latest AssetManage Home Edition 2006 does not contain any spyware and/or advertise modules, allowing installing it with no worries concerning valuable information loss. Our website has thoroughly tested home & hobby product AssetManage Home Edition 2006, written the review and uploaded installation file (23138K) to our fast server. Downloading AssetManage Home Edition 2006 will take several minutes if you use fast ADSL connection.